Who would have thought, when walking past a pretty periwinkle plant, that it could have amazing health benefits? Vinpocetine, which is also known simply as periwinkle extract, actually comes from a substance known as vincamine. It’s found within the periwinkle plant and has been found to be excellent for using in alternative treatments. “Alternative,” means that it’s a natural method of treatment, but should never be used to replace doctor recommended treatments without the express consent of your doctor. When used correctly, vinpocetine can aid in overall health, specifically targeting blood flow and brain health. Take a look at some of the major benefits of vinpocetine and maybe you’ll see periwinkle as more than just another pretty plant. In a 2007 Hungarian Journal post, it was revealed that vinpocetine can actually improve blood flow to the brain. This means that brain function and cognitive activity can actually be increased or repaired through the use of vinpocetine. The study in Hungary was performed on patients who had suffered from strokes which had resulted in impairment of their brain function. Across the patients, the vinpocetine had a definite positive effect on the amount of blood flow to the brain as well as improving overall brain function. A few studies have shown that vinpocetine can actually help hair loss, and one study even claims that the extract can prevent hair loss. 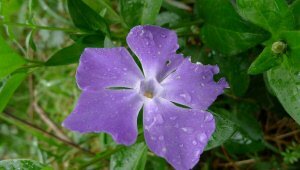 In her book, “Vinpocetine: Revitalize Your Brain With Periwinkle Extract,” author Beth Ley shows how the extract actually works as a vasodilator, aiding in the prevention of hair loss. Her study came about after the introduction of Minoxidil, which was a drug formulated to help stop or prevent hair loss. The side effects far outweighed the benefits, with some of the worst being low blood pressure and severe chest pains. Ley claims that vinpocetine has the same benefits as Minoxidil, while being safe, natural, and side effect free. Perhaps one of the most amazing benefits of vinpocetine is its amazing anti-inflammatory qualities. Research has shown that the vasodilator qualities that vinpocetine has make it a forerunner in natural remedies for inflammatory disorders such as rheumatoid arthritis. Vinpocetine has also shown incredible results in being able to reduce lung inflammation. Patients who suffer from asthma or obstructive pulmonary diseases suffer from severe inflammation of the lungs, which is generally treated with steroids. Steroids, as most know, have negative side effects; especially if used for an extended period of time. During several research studies, the effects of vinpocetine on lung inflammation proved to have the same effects as steroids, with absolutely no side effects. As research continues, it’s seeming more and more that this little periwinkle plant could be the next big thing for those suffering with pulmonary diseases. Have you ever experienced that strange and sudden light-headed feeling that makes you feel as if you are going to fall over? Perhaps you stand too quickly and the room starts spinning and you feel like you are going to lose your lunch? That feeling is known as vertigo, and it can actually be aided through the use of vinpocetine. Vinpocetine can rid you of vertigo while having no side effects and being completely safe. After its amazing results on so many medical issues, vinpocetine is being put to the test on other health issues as well. In nearly every disorder that vinpocetine has been tested on, at least 55% of the patients showed signs of improvement over time. People often fail to realize the difference between medical drugs and natural remedies like vinpocetine. Drugs alter your body’s natural state and force it to do something else. Your body has a difficult time responding to the foreign item and side effects are the result. Natural alternative remedies such as vinpocetine actually work with your body’s natural functions to help return it to its proper state. The results may take longer to become evident, but you aren’t forced to suffer side effects that are often worse than what the drugs were prescribed for in the first place. The only limits related to vinpocetine apply to those with excessively low blood sugar and pregnant women. Vinpocetine is a powerful, all natural extract that can have a major positive effect on your health if you give it the proper amount of time. I have looked at articles regarding vinpocetine for copd. However there seems to be confusion about dosage. Some suggest that dosage should be no more than 10 mgs 3 times a day. But is that what the researchers suggest?